Ambox templates are used on pages other than the main namespace - notably template, categories and talk to provide information to editors. The issues are not accessible. 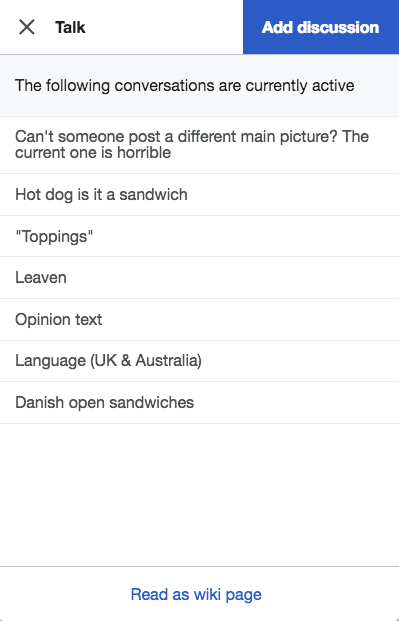 It also seems our recent changes have caused a regression with the display of these issues. Note well that this regression was fixed in T199005#4409931. 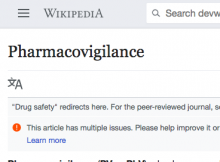 Restore the "about this page" link for talk and category namespace. A/B test should not apply here. Do not render issues if their html is an empty string. 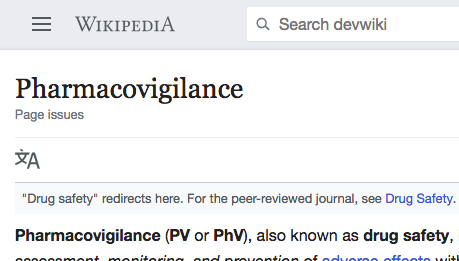 Check that on "Category:Use_American_English_from_January_2014", "Talk:Sandwich" and "Talk:Pharmacovigilance" show a "About this page" link under the title regardless of whether you are in groups A or B of the A/B test. • Jdlrobson added a subscriber: alexhollender. @alexhollender we may want to investigate redesigning these. This bug is just about restoring the old behaviour to avoid a regression. Feel free to open a new task to think about that. • Jdlrobson removed a project: Regression. Dropping priority now regression part of this task has been addressed. ovasileva raised the priority of this task from Normal to High. ovasileva moved this task from Upcoming to Current Sprint (and resolved 2018-19 Q1) pre-milestone on the Readers-Web-Backlog board. • Jdlrobson assigned this task to alexhollender. This code is on reading web staging. 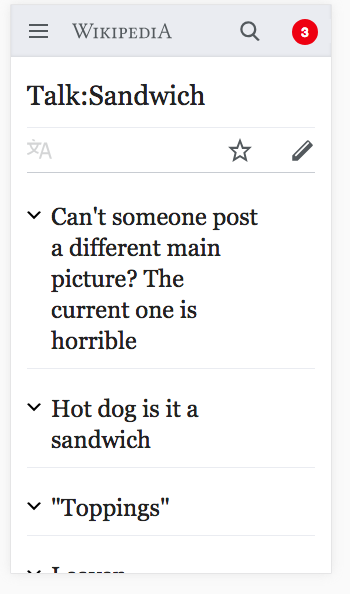 @Jdlrobson regarding design improvements — do you think it would be appropriate to give these the same visual treatment as page issues? It seems like they are basically the same thing, just on non-main namespace pages. 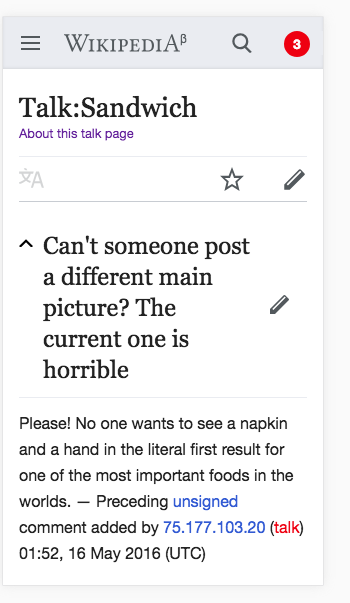 Also, do we need to think about how people can access them from the non-Wiki version of the Talk page? @alexhollender ideally yes although Olga has already said this is all out of scope for the issues project. We would want to do a similar Jan style audit of all the templates before starting that adventure. 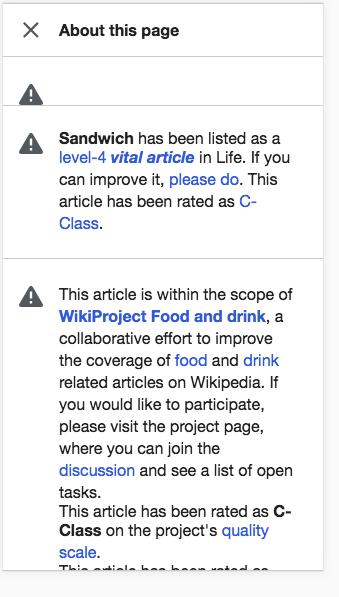 @Jdlrobson: So I see now http://reading-web-staging.wmflabs.org/wiki/Talk:Sandwich has "About this Page" link and it takes me to issues page and there is no empty rows on that issues page. 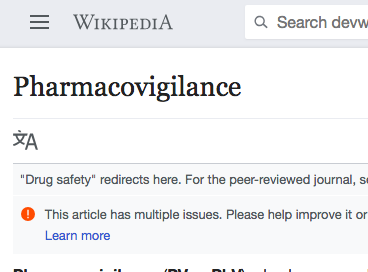 I also checked that when I go to http://reading-web-staging.wmflabs.org/wiki/Pharmacovigilance, there is this banner about issues regarding that page and it takes me to the issues page. But, I have no idea about how to test it for different user groups for A/B testing, I tried by clearing the session with localStorage.clear(); sessionStorage.clear() in an attempt to get bucketed as a different user group, but every time I got the banner not the link. So not sure, if I am doing it right. Hey @Ryasmeen http://reading-web-staging.wmflabs.org has an A-B test running on the main namespace with 50% bucketing. ABorbaWMF moved this task from Backlog to Ready on the Audiences-QA board. Okay, this time I finally got bucketed to get "page issues" link rendered under the heading. So marking it as verified.